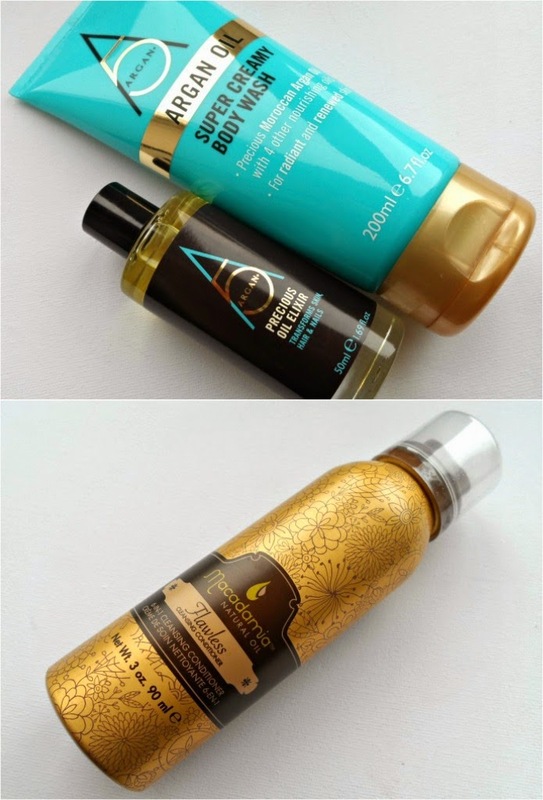 Sophsterlicious • UK Blog: ~ Some In Shower Loves! ~ Some In Shower Loves! So, Summer is on it's way (apparently!) and we're all wanting to start buffing and shaving and getting all Summer ready, right? I know Summer for me means trying to control my hair, and keeping my skin feeling soft and hydrated. I've been absolutely loving these products lately. First, the Argan 5* range (available here) is to die for! I have been loving oils for my hair for years, but now oil in my body wash too! This wash is divine, it smells so fresh, it lathers really well and feels so luxurious on the skin and, once rinsed away, I am left with super smooth, supple skin.. Of course, I then go and apply some oil to places where I get extra dry, just for some extra smoothness, and because it smells so good. I've actually had to stop leaving the body wash in my bathroom because I swear my boyfriend had been having a sneaky wash with it! As for the oil.. It's a great oil, perfect for multi-use which always pleases me. I have used this for hair, body, nails, dry skin and even on my face, the packaging suggests mixing a drop with your moisturiser and that's a great idea which had never even crossed my mind before - works a treat for nighttime, really working at your skin overnight so that I wake up feeling soft and hydrated. I've also been enjoying this Macadamia flawless cleansing conditioner*, this is a cleansing conditioner for the hair.. It took me a few times to actually figure it out! It works like co-washing does (washing your hair with conditioner only) which I have tried in the past, but always failed at because I missed the lather of shampoo. This doesn't lather, but it works so nicely on my hair, I have natural curls and lots of thick hair, this helped to tame it SO much! My hair literally feels amazing each time I use it, it air dries into it's natural curls so much nicer and looks so shiny and healthy, I swear you would not think I hadn't used shampoo and conditioner, and it also doesn't leave my hair feeling super condition-y slick and greasy, which was something I worried about, and it minimises drying time too! Having thick hair means that takes ages for me.. Not so much with this, it was try in a few hours naturally (which can usually take about 5/6). Now, the downside is the price, this is expensive and for me would only be something I would save to use for special occasions - as much as I would love to use it every wash. So there we are.. Some lovely in shower goodies that I've been loving lately. What do you love to prep for Summer? Lovely Locks! ~ L'oreal Oil Spray.